Chris Packham, Michaela Strachan and Martin Hughes-Games are at the Wildfowl and Wetlands Trust's Slimbridge reserve. They explore the UK's spectacular coastline and marine life. 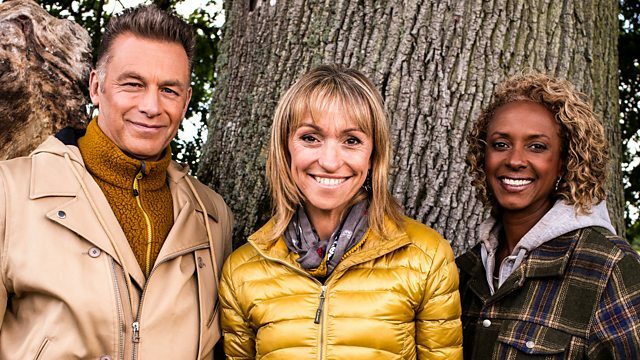 Chris Packham, Michaela Strachan and Martin Hughes-Games broadcast live from the Wildfowl and Wetlands Trust's Slimbridge reserve. The team explore the UK's spectacular coastline and marine life. They report on the dramatic rescue of fledging gannets, get to grips with our common lobster, and experience the autumn spectacle of thousands of waders gathering in our estuaries. There's an update on the migrating Bewicks's swans arriving at Slimbridge, and guest presenter and naturalist Iolo Williams takes to the high seas, searching for a giant of the deep, the fin whale.